Great new pedal from OKKO. + + + "This is gonna be the new secret weapon in your rig. You need one. Everybody needs one. At least one. The POWER EQ is a 3-band equalizer (+/- 12dB) and a super versatile clean boost (+/- 20dB). This flexible tone tool can do a lot of things and it does all of these extremely well: Easy to use, musical EQ. Graphic equalizers certainly allow more precise tweaking but they need to be carefully adjusted to avoid artificial sounds. The POWER EQ allows easy changes on the fly and always sounds natural and musical. Use it as a booster. Boost the frontend of your amp or your overdrive pedals for more distortion. Use the EQ to easily dial in the exact sound you want. Give your amp a clean channel. Your amp has one channel and a crunch sound to die for? Set it where it sounds best, then reduce the gain with the POWER EQ. Voilà – clean channel with tone controls! Match different guitars. You use different guitars during the set? Instead of re-adjusting half of your pedals, just match the level and sound of different instruments to your liking. Use it in the FX loop of your amp for a volume boost or as an alternative set of tone controls. Give new life to old pedals. Try the POWER EQ in combination with your pedals. A Tubescreamer with balls! A Rat with scooped mids! A fuzz with tone controls! Before or after pedals, possiblities are endless ... 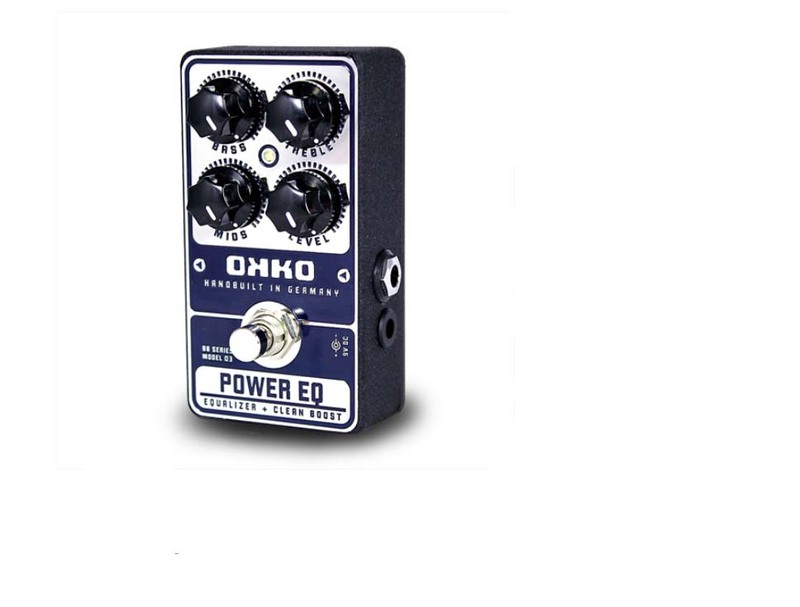 The OKKO POWER EQ is based on the vintage Ibanez GE-300 Power Equalizer. A great piece of gear but it’s long out of production, came in a quite bulky case and required a special 18V power supply. Our version comes with a much smaller footprint and runs on standard 9V power supplies (the voltage is brought up internally to 24 volts for maximum headroom and clarity). I also did some changes to the filters and thanks to superior parts the noisefloor is even lower than in the (already very quiet) vintage Ibanez EQ."